Lift always acts in a direction perpendicular to the relative wind and to the lateral axis of the aircraft. The fact that lift is referenced to the wing, not to the Earth’s surface, is the source of many errors in learning flight control. Lift is not always “up.” Its direction relative to the Earth’s surface changes as the pilot maneuvers the aircraft. The magnitude of the force of lift is directly proportional to the density of the air, the area of the wings, and the airspeed. It also depends upon the type of wing and the AOA. Lift increases with an increase in AOA up to the stalling angle, at which point it decreases with any further increase in AOA. In conventional aircraft, lift is therefore controlled by varying the AOA and speed. An examination of Figure 4-8 illustrates the relationship between pitch and power while controlling flightpath and airspeed. In order to maintain a constant lift, as airspeed is reduced, pitch must be increased. The pilot controls pitch through the elevators, which control the AOA. When back pressure is applied on the elevator control, the tail lowers and the nose rises, thus increasing the wing’s AOA and lift. Under most conditions the elevator is placing downward pressure on the tail. This pressure requires energy that is taken from aircraft performance (speed). Therefore, when the CG is closer to the aft portion of the aircraft the elevator downward forces are less. This results in less energy used for downward forces, in turn resulting in more energy applied to aircraft performance. Figure 4-8. Relationship of lift to AOA. Thrust is controlled by using the throttle to establish or maintain desired airspeeds. The most precise method of controlling flightpath is to use pitch control while simultaneously using power (thrust) to control airspeed. In order to maintain a constant lift, a change in pitch requires a change in power, and vice versa. If the pilot wants the aircraft to accelerate while maintaining altitude, thrust must be increased to overcome drag. As the aircraft speeds up, lift is increased. To prevent gaining altitude, the pitch angle must be lowered to reduce the AOA and maintain altitude. To decelerate while maintaining altitude, thrust must be decreased to less than the value of drag. As the aircraft slows down, lift is reduced. 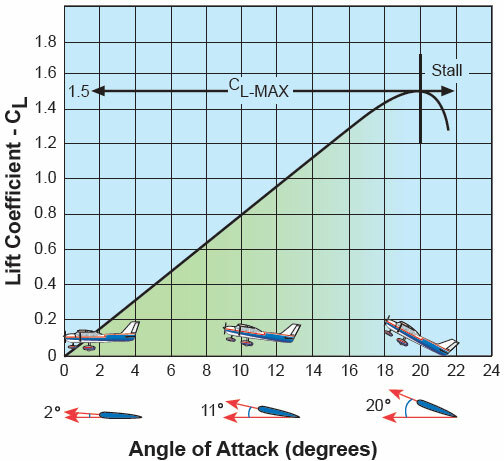 To prevent losing altitude, the pitch angle must be increased in order to increase the AOA and maintain altitude.